Where’s Waldo on Google Earth? Being a child of the eighties, I have particularly fond memories of a goofy, lanky guy in a striped, red shirt; glasses; and a funky beanie. Those of you who also grew up in the eighties no doubt felt much like I did when – as you strolled with confidence into your school library, you found that your nemesis had already checked out the only version of Where’s Waldo? The humanity! The audacity of that little twerp who took your favorite find-it book — who prevented you from avoiding intellectually stimulating activities in place of mindlessly looking among a culturally homogeneous scene to find that one stand-out, the sore thumb, the man we all knew and loved — Waldo. Waldo is back. And better than ever. He’s taking Web 2.0 by storm, all while helping raise awareness of Geography. 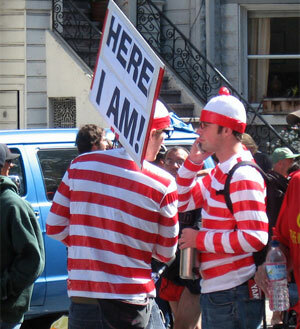 And the ultimate example of this is Waldo’s new appearance in an undisclosed location in Vancouver, British Columbia. 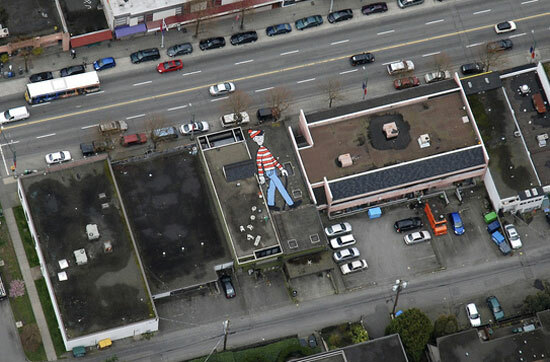 In order to find this iconic Poindexter you should – nay, you must – navigate post-haste to Vancouver, Canada in Google Earth and browse around until you find dreamy glasses and a googlie-eyed (no pun intended) smile shining back at you from the roof of a building. NOTE: Waldo is not yet appearing on the regular online version of Google Maps, it should take a few months to propagate there, so you will need Google Earth. In fact, I’ll up the ante: The first person to send me the coordinates of Waldo (no cheating) wins a free signed print of Neverland Ranch. It’s a little reward for being a Bearings reader. Let the race begin! This entry was posted on Monday, April 14th, 2008 at 8:01 pm	and is filed under Geography in the Media, Geotagged, Must See Geography, Off the Charts CrAzY!. You can follow any responses to this entry through the RSS 2.0 feed. You can skip to the end and leave a response. Pinging is currently not allowed. If the picture that you posted is where it is GOING to be once Google Earth sends out it’s latest images…then it’ll be on West 4th between Maple and Cypress Street (South side of the street, 4th building in from Maple Street heading east)…coordinates latitude 49?16’4.28″N, longitude 123? 8’58.67″W. I don’t show a Waldo yet on my copy…but it’s certainly the building. You are correct, Simon! Actually, I misread the report. Waldo should not appear on either Google Earth, or Google Maps for another six months. In any case, I owe you a print! Where should I mail it? It is on the top of the Australian Boot Store next to Zulu Records. 1968 W 4th Ave, Vancouver, BC, Canada Did you already give away the Litho? There is a smiley face made of shrubs on a big estate West-Northwest of London. I saw it by accident on Google Earth and laughed. With the latest Google StreetView camera, you can read addresses on some mail boxes! You can see a jetliner over the Western Australian outback, and another one flying over Lake Pontchartrain after leaving the New Orleans Louis Armstrong Airport North/South runway. Yes, I’m an Internet addict.